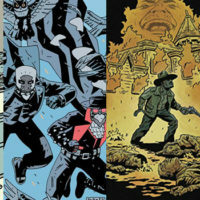 The Marvel Universe is a wonderfully eclectic creative landscape. For every cinema-friendly hero such as Spider-man, Daredevil or Silver Surfer there’s a Howard the Duck, Shang-Chi or Man-thing; delightful oddball creations that jar with the modern, “serious” Marvel landscape. Skulking uncomfortably within that latter group are the Skrulls, little green men with baboon-arse chins and a tendency to shape-shift. Not that the Skrulls are necessarily a terrible concept; they work fine in the colourful pages of Fantastic Four. But their hitting the MU so shortly after the Civil War event with an alien invasion leaves me with the same sense of apathy I get from watching a news presenter informing me of a terrorist strike before moving merrily on to the day’s sport. The problem is that so little effort is put into the doppelgangers once they are exposed. Grant Morrison’s JLA2 was told from the perspective of the alternate Earth Justice League, and almost gave its central villains a sense of nobility. Here there is little room for character development, and any attempt at characterisation or allegory is lost somewhere between Spider-man’s tirade of stupid remarks and the endless squabbles between superheroes and their retro counterparts. Bendis struggles with his enormous cast, but who wouldn’t? At times the book reads like a ‘Who’s Who of the MU’. Leinil Yu’s art is always great, and some of his double spreads are the Marvel equivalent of Where’s Waldo?/Wally?… and perhaps this book will be enjoyed most by those new to characters such as Ms. Marvel or Elektra, and desiring a reasonable primer. 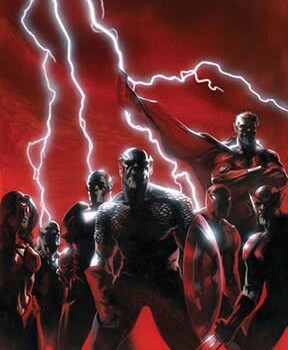 Though Secret Invasion is far too condensed to allow for any degree of depth, I did enjoy how that the Skrulls were ultimately portrayed, with their treatment of Earth resting someplace between that of the Roman Empire and a planet of desperate refugees… who happen to have shape-shifting abilities and big, big guns. Strangely enough, our heroes may refuse to kill scum like Bullseye or Venom, but have no problem mercifully murdering the homeless aliens. There’s little positive to say about Secret Invasion other than that it serves as a bridge between the excellent Civil War event and the, at time of writing, equally brilliant Dark Reign, which will wisely be spread over various titles without the limited series to tie them together. 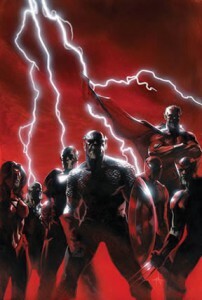 As a way of shaking the Marvel universe up, and passing the power from Stark, S.H.I.E.L.D. and company to Norman Osborn’s cabal of villains, Secret Invasion simply serves its purpose.